Made it back to The Waiting Room in time for the start of Best Coast. I don’t know if it’s an endorsement of the band or an indictment of SXSW, but Bethany Cosentino and Co. were on point last night, playing way better than when I saw them in Austin in March, where they looked bored as if fulfilling a commitment (which they were). Last night they were into it, ripping through one song after another, Cosentino’s long hair (along with sideman Bobb Bruno’s) floated ethereally alongside her head, blown skyward by electric fans Cosentino said they were trying for the first time on tour. 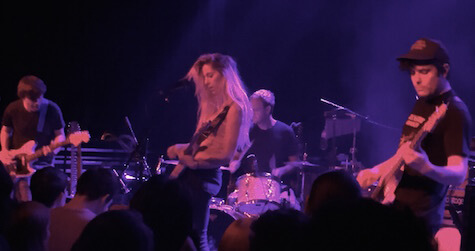 Whereas I liked Best Coast’s energy, the band did little more than play through their set list, which isn’t enough to keep me engaged, especially since I don’t own any of their albums.